Ok, I'm a cosplay newbie and was thinking of cosplaying a character from Soul Calibur II(Talim or Xianghua). My bf told me that was silly because people probably wouldn't recognize the character and that I'd be better of with a character from King of Fighters or Streetfighter. Do people cosplay Soul Calibur characters at cons? I'd appreciate any opinions before I get my heart set on a specific video game character. Thanks! Soul Calibur is often cosplayed at conventions, and with good reason. Of all the 3D fighters, its got some of the most creative characters seen (anywhere even). At just this past Anime Expo there was a horde of SC costumers (see the pics in Eurobeat King's AX gallery on this site). Hopefully at Otakon, there will be another group. Just about everyone who plays fighters knows about Soul Calibur. However, I will say that Xianghua is more recognizable than Talim is, only because she's been in the last game too. 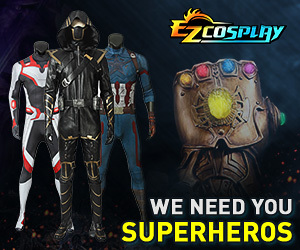 Anyway, to see some of the SC costumes Ive seen personally on the east coast, take a look at my [URL=http://members.aol.com/deathcom5/]site's[/URL] front page. Do it! Do it!! Talim & Xianghua are both good SC picks. My cousin did cervantes (check my gallery) a charater no one would cosplay, and he love it. Ppl knew who he was at the con, and I've seen loads of Xianghua's arounds. I'm going as Seung Mina(sc2) & Mitsurugi (sc1) this year for Otakon, and if no one know who I am...It's fine but I will have loads of fun doing it. I say go for it. I love Soul Caliber and would also someday love to do a costume from it. Actually I really want to do Nightmare but that costume is soo freaking hard and I just don't have the time, money, experiance to do it. But yeah, if you want to cosplay Soul Caliber, go for it. I'm planning on doing on of those two costumes (hopefuly both, if time and money persist ^-^;; ) in the future, and go ahead and do it. Besides, you decide who you want to be anyway. uhh, i have a weird situation. yunsung isn't as recognizable as some of the other characters. and it seems that a lot of people don't remember all the guy characters from SC2 either...hehe. 1. the few that actually who i actually was said "hey! you're yunsung. awesome!!" but they didn't take my picture? 2. those who mistakenly knew who i was called me "hwang." wait til 2k4 cons and you'll see my hwang. but until then, i only have a yunsung costume. oh and those ppl who called me hwang actually took my picture. 3. the bulk of the people took my picture b/c i was w/ some girl that they recognized, either that i was w/ a lenne, jibriel, whatever. it didn't matter that we weren't from the same series...they still took our picture. haha. 4. and a lot of times, people said "cool costume/your sword is awesome." and they'd talk to you....but they had NO idea what game you're from. so yeah i'd say that it's not too recognizable for guys, but for girls you should have no problem. and the hype of the US console release has got a lot of people looking into the game. by that time, a lot of people will be able to recognize you. i wish i could have done my XiangXua from Soul Caliber this year, but it proved to be really difficult for me, but it doesn't mean that if I see any of you guys at Otakon I won't take any pictures! Soul Caliber is the best game series EVER! man! Id love to see someone pull that off right! It would take some crazy skillz to do Nightmare. I hope to do an Ivy costume (2nd outfit from the 1st game) sometime in the future..maybe at Anime Boston? Yeah... That my next outfit the IVy 2p form SC1. I love that look.